Word spread quickly. Scott Foster was actually GOING IN TO A GAME for the Chicago Blackhawks. His buddies enjoyed watching his first-star performance. HEY, COME AND CHECK THIS OUT! The players rushed into the lobby, many still wearing full equipment and skates. If true, this was too good to miss. They clamored for views of the television, which was showing the third period of the Blackhawks-Jets game at United Center, located less than a mile away. The man wasn’t joking. There on the screen, sporting a No. 90 jersey below his familiar steel gray mask, was 36-year-old Scott Foster: adult league teammate, professional accountant and now, thanks to an absurd confluence of fluky circumstances, NHL goalie for the Chicago Blackhawks. To the boys watching back at Johnny’s, this was all a riot. They know Foster as a mild-mannered, stay-at-home netminder, a father of two young daughters who always hits the ice before anyone else to warm up. They know that he graduated in 2006 from Western Michigan University, where he played varsity hockey for four years but only started for two, and that now he works at Golub Capital, mostly in corporate accounting. They did not know that he used to stuff hockey trading cards in his skates for good luck, though they are not surprised; he is a goalie, after all. Only in hockey. “I’ve been hearing that a lot,” Johnson says, because where else can an equipment manager like Jorge Alves (Carolina, Dec. 2016) or a barhopping journeyman like Alfie Moore (Chicago, Apr. 1938) actually live out a childhood fantasy? 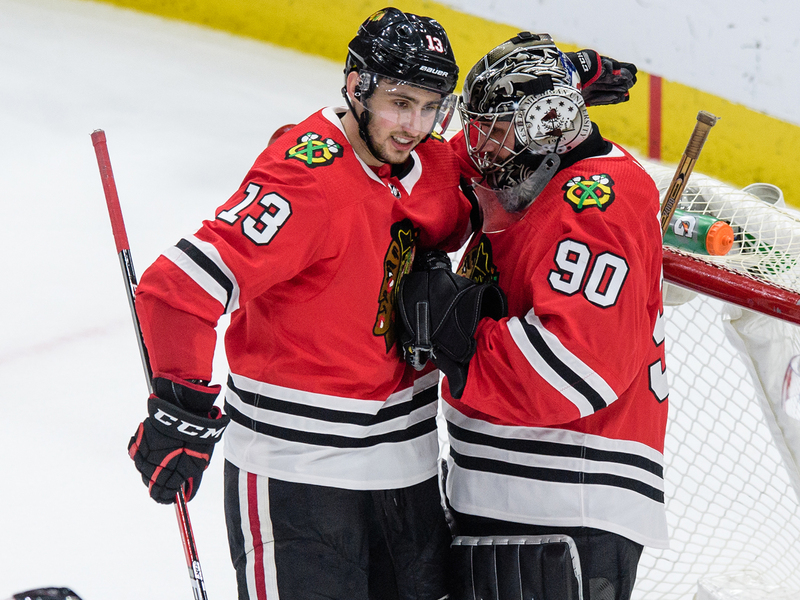 Most emergency goalies remain anonymous, munching popcorn in the press box and leaving with nothing but a free ticket, which is what Foster had done during his previous dozen or so trips to United Center … until he received word that Anton Forsberg had been hurt during warmups and the Blackhawks needed Foster to dress … until he received word that Delia went down and he needed to play. His hockey buddies, however, are happy to talk. Many of them are former college players, or better; Sebastien Geoffrion, grandson of “Boom Boom” Geoffrion, was called up to the ECHL last season, while former NHL center Andy Hilbert is scheduled to face Foster this weekend over a best-of-three series in the Elite League semifinals. But none of them have ever seen anything quite like this. Late Thursday night, Olson fired off an email: Hey, unbelievable, Mr. Foster. Remember, when they ask for the movie rights, don’t forget about us.